Day 5: Learning to Fly – The San Francisco Bay Trail: It's Closer Than You Think! The Golden Gate Ferry ride from San Francisco to Larkspur seemed to go by in minutes and my Clipper card helped make the trip seamless and simple. Swipe, board, ride and the next thing you know, Sir Francis Drake himself is greeting you in Larkspur – well, his 30 foot likeness in Remillard Park at least. About a half mile east of Remillard Park, a thin stretch of shoreline just east of the ferry terminal, I had a decision to make – turn left at Anderson Drive and then backtrack up Bellam Avenue to my ultimate destination of Shoreline Park or continue onto a highway on-ramp for about a half mile. I opted for the on-ramp, ultimately risking life and limb to save thirty minutes of what would likely be my shortest hike of the next thirty days. Was it worth it? No. After brushing off my brush with death, I approached Shoreline Park in San Rafael admiring the vistas that stretched both east to the Richmond-San Rafael Bridge where a marine layer split the sky in two and west to Mt. Tam where its micro-climate cloaked it in fog that would burn off within an hour. The Bay Trail is raised here creating a divide between the wetlands preserve and the Bay. The wetlands sparkled in a technicolor of soils and algae while the bay was met with tall grasses and wildflowers. 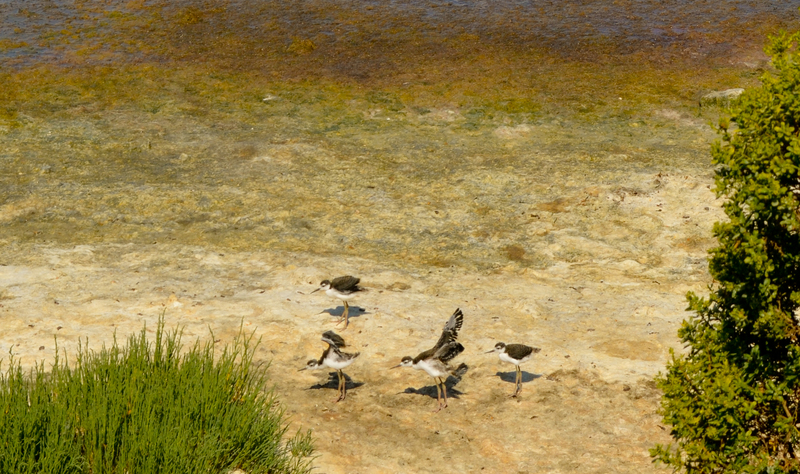 I picked a perfect week to be trekking these parts because, like yesterday’s newly hatched ducklings, today I was pleased to see four black necked stilt chicks huddling by some tall grasses and shoreline shrubs . I kept my distance, respecting that this is their home and I was just an uninvited visitor. Nevertheless, their parents made it clear they wanted no part of me and wished I would just go away. So away I went. Today I had company, by the way! Ian, a photographer for the San Francisco Chronicle, joined me for the hike in its entirety and documented part of my journey. As we finished up our hike at the San Rafael Transit Depot, we approached a guard at the San Rafael Transit hub to inquire about the next departure to San Francisco and he advised us that the Golden Gate Transit 101 Express leaves at ten past the hour, every hour. With that in mind, Ian went to the front desk, purchased a Clipper Card and officially joined the public transportation fan club and hopefully, after today’s hike, the Bay Trail fan club as well. The bus was on time and the trip back to the City took all of about twenty minutes!